Sam Felsenfeld, the founder of the Operation Jack Autism Foundation, is raising three children with his wife, Tiffany, whom he married in 1999. 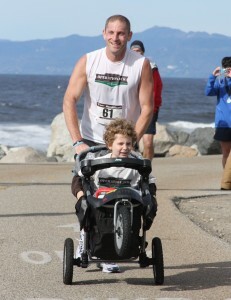 His middle son, Jack, is severely autistic, which inspired him to create the Operation Jack Autism Foundation in 2009. Sam’s road to Operation Jack started on November 7, 1991, when he broke his neck but escaped paralysis. For years, he was grateful to have use of his legs, but always wondered why they were spared. In college, he took up drinking and smoking, and his weight soared to 261 pounds in 2003. He started walking to lose weight in late 2004, then eventually started to run. In early 2006, he ran a mile faster than 8:30 for the first time in his life. In June 2006, he completed his first full marathon. On November 7, 2006, 15 years to the day after breaking his neck, his son Jack, then 3, was diagnosed with severe autism. Sam continued to run and ran his eighth lifetime marathon in 2007 in 3:00:05 (6:53/mile), just off of his goal of 2:59:59. As he continued to train, and continued to raise Jack, he realized his legs had a purpose — they weren’t spared just for him to chase six seconds. After more than a year of brainstorming and planning, he launched the Operation Jack Autism Foundation on July 1, 2009. The initial mission was to run 60 marathons in 2010, to raise money and awareness in the fight against autism. I have an opportunity to do something huge in my son Jack’s honor. It’s incredibly sad to watch him and wonder what’s going on in his mind. He’s nearly 6 years old, but does he know who I am? Will he know I’m gone when I’m off running these races? I have faith that he’ll get better, but I am concerned about how much he’ll ever be able to mainstream. It’s very likely that he’s always going to have his problems. But I pray that this endeavor is successful, and maybe someday down the road, other kids won’t struggle as a result of Operation Jack. I’d love for him to have an impact beyond what he’d ever know or understand. I’ll always be sad that he won’t have a typical childhood, but it would be comforting to know that he has a purpose and that there’s a reason for it all. Sam successfully raced 61 marathons (26.2 miles) and two ultramarathons (45 miles, 54 miles) in 2010. That first year raised about $90,000 and led to the creation of the Operation Jack Marathon. It also had a role in the creation of seven new Train 4 Autism chapters. Sam finally reached his individual goal of 2:59:59 or better in his first race after the initial 61-marathon mission, finishing the 2011 Boston Marathon in 2:57:53. To date, he’s completed 124 marathons and six ultramarathons, including 32 Boston qualifiers. His autism fighting continues through Operation Jack, one mile at a time, one day at a time. Operation Jack has teams, events and participants from coast to coast. Everything Sam does for Operation Jack is on a volunteer basis, after he’s done with his full-time job and after the kids are in bed. It’s something he does because he believes it’s his mission and that his efforts will make a difference and help people.